When did Europeans first reach North America? This question has preoccupied historians for many years, and has produced a multitude of answers, some more plausible than others. This is an area of history where evidence is scanty, and speculation abounds. There are only two fixed points of fact, events that we know happened. First, archaeological evidence and the Icelandic sagas have established that the Norse arrived in Newfoundland and Labrador around 1000 CE. Second, there is no dispute that Zuan Caboto (John Cabot) sailed from Bristol to North America in 1497. Whether other Europeans explored the region before the Norse, or between 1000 and 1497, is unclear. 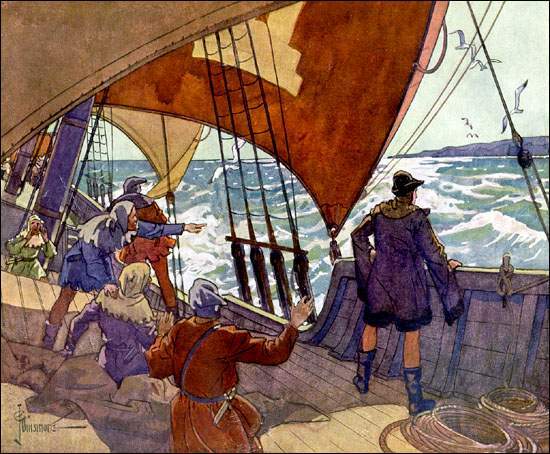 John Cabot in the Matthew off Cape Bonavista in 1497. Painting by C. Dinsmore. From J.R. Smallwood, ed., The Book of Newfoundland, Vol 2. (St. John's: Newfoundland Book Publishers, 1937) 1. There are legends. The most famous are the story of St. Brendan's sixth century voyage from Ireland, and the fable that a Welsh prince, Madoc, reached America in the 12th century. More realistically, others have argued that Portuguese voyagers sailed to Newfoundland in the 1470s – indeed, that Joäo Corte Real was the actual "discoverer" of America. And in Bristol, there exists a firm belief, backed by some documentary evidence, that mariners from that port were crossing the Atlantic before John Cabot arrived. All that can be said for certain is that during the 15th century, as Europeans began to look for sea routes to Asia, stimulated by dreams of the wealth to be made trading in spices and precious metals, so the geography of the globe became known more accurately. Europe was expanding, and a part of the process was the progressive exploration of the Atlantic Ocean. Certainly, the Portuguese were sailing further to the west, and all along the Atlantic seaboard there was a growing interest in a direct, western route to Asia. While there is no firm evidence of European explorers in Newfoundland and Labrador between, the Norse and John Cabot, the suggestion that Portugese and English voyagers reached the shores of eastern North America before Cabot is broadly consistent with what we know of the times. The Norse exploration of North America, though by far the earliest for which we have definite proof, left no permanent legacy. On the other hand, the voyages of John Cabot, soon to be followed by others, began the European exploitation and settlement of what was to Europeans, a new founde lande. For other related articles view the Early Exploration section of the Exploration and Settlement Table of Contents.